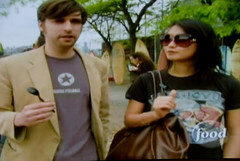 I had fogotten about it completely, but I wore my Daring Fireball t-shirt to that FoodTV taping. It aired last night, and now folks are talking about it. Props to John Gruber (one of my favorite Macintosh bloggers) for the sweet threads! AppleÂ® today introduced Boot Camp, public beta software that enables Intel-based Macs to run Windows XP. Available as a download beginning today, Boot Camp allows users with a Microsoft Windows XP installation disc to install Windows XP on an Intel-based MacÂ®, and once installation is complete, users can restart their computer to run either Mac OSÂ® X or Windows XP. Boot Camp will be a feature in â€œLeopard,â€ Appleâ€™s next major release of Mac OS X, that will be previewed at Appleâ€™s Worldwide Developer Conference in August. …intern. Yup. I’m going to intern with Apple in Cupertino this summer, working with the .Mac web team. If you know me, you know how excited I am. I haven’t mentioned it here on the blog for fear of jinxing it, but now that it’s official (well, just about official. They still have to do a background check on me. Hmmm, will that traffic violation come back to haunt me? Hope not! ), I thought I’d write a little bit about the experience of interviewing for the position. Couple of new features I hadn’t noticed in today’s release of iTunes 5. 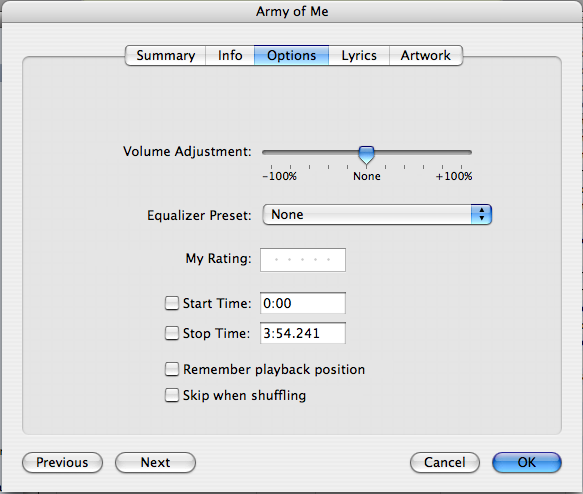 Two options — “Skip when shuffling” and “Remember Playback Position” are new, I believe. The remmber playback position was something that was usually reserved for audiobooks, but then with the Podcast features of v4.9 itunes would do just that to .MP3 podcasts; now you can apply it to any track. So Tuesday was my first day of Graduate School. My first class was Intro to Computational Media, taught by Dan O’Sullivan. I’m very excited about this class — generically, the basic concepts of programming are taught, mainly using [Processing 1.0](http://processing.org/). Processing seems like a cool language — I’d played around with some of the examples on its website a while back. It’s sort of Java-lite; the developers have stripped down Java’s overly complex syntax to a useful minimum and made a simple environment for programming. >Processing is an open source programming language and environment for people who want to program images, animation, and sound. It is used by students, artists, designers, architects, researchers, and hobbyists for learning, prototyping, and production. It is created to teach fundamentals of computer programming within a visual context and to serve as a software sketchbook and professional production tool. Processing is developed by artists and designers as an alternative to commercial software tools in the same domain. There’s a lot of visual applications as this seems to be the initial audience (check out the [examples](http://www.processing.org)), but it can be used for other things as well. And what’s cool is that the final output is Java; by the end of the semester the basic Processing syntax is peeled away to reveal its Java underpinnings, and more advanced functions can be implemented this way. Even more important than the language and the concepts of programming, the class is about figuring out what kind of stuff you want to do with it. That’s the hard and fun part — for all the cool projects and ideas I’ve had over the years, I find myself on this first day feeling absolutely devoid of any creative spark. Which is okay — I’m sure it will come, but it’s a weird and ironic feeling now that I’m in this super creative environment. My second class was *Applications*, which is taught by Red Burns, the department chair and founder of the program. It’s a seminar class where she invites a guest lecturer each week to present on ITP-related projects in the real world. Our first speaker was Heather Greer, an ITP alum (class of ’94 (!)) who has gone on to work as a photographer, cinematographer, filmmaker, relief-worker, installation artist, and it seems like twelve other things. Her work focuses on the connections we make with people as our reason to survive. I’ll try and find some links to her work and post them here, but suffice it to say she was an inspiring first guest as to the possibilities and opportunities that can arise from ITP’s multidisciplinary, collaborative approach. Applications is also the only class that all incoming students take together, so it was a great opportunity to see everyone’s face and get to know some of the people I’ll be working with. We are divided into groups of five to present a response to the previous week’s speaker, so I met and enjoyed hanging out with the folks in my group. After class several of us went to Cedar Tavern for a drink, and it was amazing to sit and talk with people who were so engaged about *creative* uses of technology. With a few exceptions, I’m accustomed to people’s eyes glazing over when I start to talk about cool tech projects I’ve been seeing or thinking about — this was probably the first time I’d sat in a group of six or seven people who were all totally engaged in the discussion. Very cool. So here’s my attempt at staying up-to-date on the blog with my ITP adventures. I have a feeling my time is going to soon vanish and blogging will once again take a back seat, but I’ll do my best to keep it fresh. Nokia 7610 wants to send you a message. Accept? I gladly accepted, being surprised and a bit excited that someone had a Series 60 phone (series 60 is the interface of Nokia’s smartphones, like my Nokia 6620), and had the wherewithal to send a Bluetooth message. Almost immediately the same alert popped up again, and again and again as I pressed no, I would not accept. I looked in my inbox and found the file that was being sent to me — CABIR.SIS — a Symbian installation file (Symbian is the actual operating system that Series60 and other ‘smartphones’ run on) had been delivered several times. I knew well enough not to open it. First of all, I had heard of the Cabir virus spreading around Europe, one of a handful that infect symbian phones, but even if I hadn’t, I don’t think I would have opened a random installation file someone had sent me. Don’t open attachments from people you don’t know. It’s like a mantra, and it’s just as true with cellphones as PCs. This particular virus is relatively harmless — once installed, it attempts to transmit itself to any nearby Bluetooth device; once that device is infected, the same thing happens. Pretty soon, everyone is infected. The biggest downside is a drain on battery life and performance as your phone gets overloaded trying to send messages and files via the Bluetooth radio. Your phone is infected with a virus. Believe it or not! but sadly, by the time I tried to send it back out the the phantom Nokia 7610, it was no longer in range (or it’s battery had just died, which is not unlikely). I love my smartphone. I love being able to install custom applications, the modularity and expandability make my mobile computing life much more satisfying. But if viruses are already this commonplace — especially among non-savvy users, i.e., people NOT like me –, we’re in for a long haul when it comes to acceptance and growth of the mobile phone as the everyman’s computing platform. > Combining nostalgia for the oh-so-1994 http:// with a cool tip by pal Duncan for using the otherwise barely-functional RSS reader in the Safari browser, I now routinely type feed:// (or feed: for short) where the http:// should be (e.g. feed:news.bbc.co.uk) and jump straight to a nice Table of Contents for any site sporting an auto-discoverable RSS or Atom feed. I use [bloglines](http://www.bloglines.com) for my rss reading , and use the bloglines bookmarklet to subscribe to feeds — it does a good job, usually, but I noticed that it doesn’t always autodetect a page that I know has a feed. In addition, Safari 2.0’s rss view is nice, but the bloglines bookmarklet doesn’t like the “feed://” url protocol. I had heard a while back that some folks were porting Linux to the iPod; I had no idea how far along it had come. Check out this review of Linux for the iPod!